If you are a physical therapist, a caregiver, nurse or a medical assistant, equipping yourself with the best Hoyer lift slings will make it easier for you to transfer your patients. This is true especially if your patient is suffering from spinal cord injuries, the patient is obese, they have lost strength in their legs, or their illness has made them unable to move. Luckily, these innovative units will assist you to move the patient easily without worsening their condition. With so many products on the market featuring different configurations, styles, and materials it may not be easy for you to pinpoint the model you need. To assist you in making the best choice, we have reviewed the top models on the market. 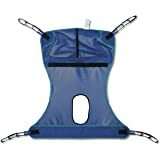 Featuring four sling points, this patient sling lift from drive medical is adaptable with most floor lifts. We love the mesh design and polyester construction that ensures comfort and durability. Another feature that makes this model stand out is that it doesn’t require any optical chain or strap and has the ability to hold a weight of up to 600 pounds. 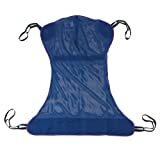 This padded U-sling comes with head support to ensure that the patient is comfortable when moving from one bed to another. The model is a great choice for patients who are partially or very dependent or those who have limited head control. The model comes with a universal design allowing it to work with most transport systems while still keeping the patient comfortable. Besides, this model comes with a large opening that allows for toileting access. This is another high-end model from Drive Medical that is designed to offer the patients with a cost-effective solution for patient transfers in homes as well as medical institutions. The model comes with a base that opens easily to increase stability during operations. This model also boasts of four slung points allowing the caregivers to transport the patient through various door spaces and other spaces effortlessly. Featuring a unique design, this body sling from Invacare is designed to suit the different needs from patients and caregivers. This model comes with an exceptional padded fabric that offers a soft comfortable laying place as well as superior comforts. 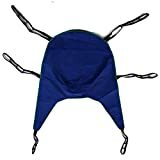 For enhanced safety, this model comes with a brushed lining, which prevents accidental falls and slides during lifting. Besides, this model boasts of a stretch resistant material that ensures that the sling retains its original shape. If you are looking for a full body Hoyer lift, you should consider getting this model. This model is designed to work with all models including Apex, Invacare, Hoyer EZ Way, as well as any other lifter that comes with four hooks. Having been constructed using high-quality materials this model guarantees you with a reliable and durable service for many years to come. Besides, this model is easy to clean and has a weight capacity of 600lbs. Moving an obese or a physically impaired patient doesn’t have to be a problem when you have this lift sling from Invacare. This unit is made using high-quality materials that does not only offer user comfort but also the comfort they need in order not to worsen their conditions. The model also boasts of a large opening to accommodate toileting. Both home bases caregivers and health caregivers agree that using this full body lift from Lumex ensures that the patient remains in a comfortable position. This model comes with a design that molds around the patient body, eliminating the need of dragging or pulling the sling, which may result in worsening the injuries. Similar to other high-end models this model comes with four positioning straps that allow for a safe weight distribution. 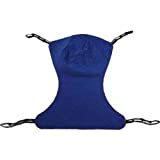 If you are looking for a padded U sling that fits most patient lifts brands including Drive Medical, Invacare, Hoyer, and Lumex this is a perfect choice. The model boasts of a head support which is an added advantage to patients who are obese, partially dependent or those with limited head control. 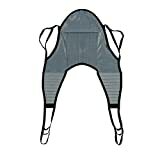 The unit is constructed using a well-padded fabric, which ensures comfort and full body support. Additionally, this model offers the patient with toileting accesses and is easier to slip on and off, making it simple to use. This is another model that comes from Drive medical. This model is engineered to ensure that you can comfortably and securely lift patients from a floor style lift. It is crafted from durable materials that withstand repeated use and frequent washing. Thanks to its ergonomic design, you can use it with other patient lift systems. Boasting of an ergonomic design and solid construction, this model offers you with all the features that allow you to make patient transfers faster and easier. The model will reduce the discomfort and stress associated with the process. You will love the brushed lining that ensures that there is no accidental during lifting. Additionally, this model comes with stretch-resistant materials that ensure that the model retains its original shape. Click here to read more about the eye massagers.